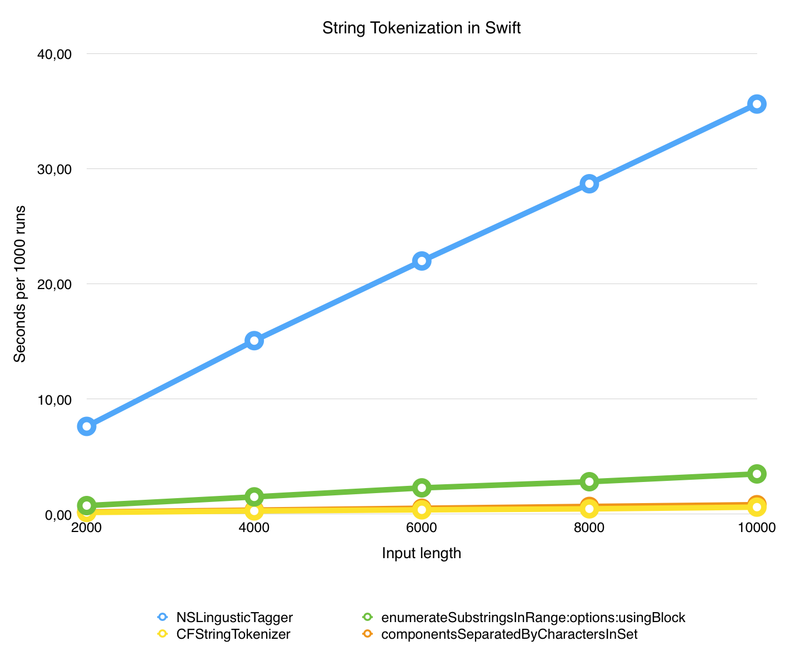 TLDR: Don’t use componentsSeparatedByCharactersInSet: to split a string by words in Swift. Depending on your needs, use either CFStringTokenizer, enumerateSubstringsInRange:options:usingBlock: or NSLinguisticTagger. But be aware of some subtle differences. I will keep this fairly short. It is a quite common task to have to split a string by words. If you’re a native English speaker — or Danish like me — there’s a good chance your first thought is to separate by whitespace and/or punctuation characters. But don’t. It will not work well for English. And it will not work at all for languages like Japanese or Chinese that do not use whitespace to separate words. In the code above which uses CFStringTokenizer, a locale is created using CFLocaleCopyCurrent(). Of course, the resulting locale will vary depending on what the current locale is. But even when experimenting with different locales I have not been able to make CFStringTokenizer match the output of enumerateSubstringsInRange for the Japanese string. As far as I can tell, Apple’s documentation does not shed any light on the differences between how CFStringTokenizer and enumerateSubstringsInRange work. There is one more thing to consider when deciding on how to tokenize your strings: performance. I’ve made some very simple measures on my MacBook Pro. I took some English text from Wikipedia and tokenized substrings of it using each method described above. I varied the substring length to see how the running time depends on the input length. The results are shown in the chart below. As you can see, NSLinguisticTagger takes way longer than the other methods. This is expected because it does a lot more work (remember, it creates POS-tags too). Interestingly, CFStringTokenizer runs quite a bit faster than enumerateSubstringsInRange. And it is even a bit faster than componentsSeparatedByCharactersInSet which means there really is no excuse for using the naive method. Below are a few suggestions for further reading. Developer, data scientist and Philosopher. Co-founder of Guts & Glory, creator of Readery and 🤘Lemmy.